The Mangalitsa is a hardy breed that originates from Central and Eastern Europe. It was almost extinct in the 1990s, when there was a worldwide population of less than 150 sows. One of the reasons they’d become so rare was that they are much slower to mature to meat than other breeds. As well as visiting the tea room, clearing woodland, wallowing in mud, and enjoying having their ears rubbed, the sows have been educating local schoolchildren. Pupils have been learning to inspect the animals to ensure that they are healthy, as part of their GCSE studies. 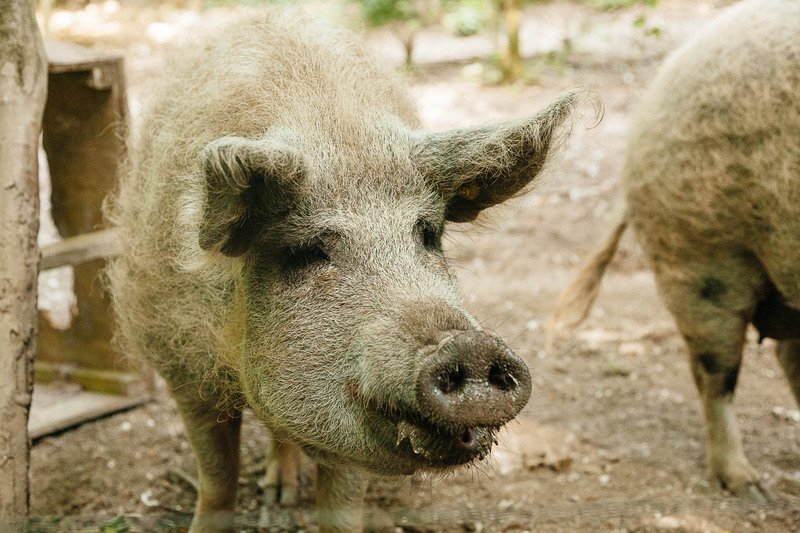 Mangalitza pigs have woolly coats, which helps to protect them from sunburn. “We’ve joked with the children sometimes that these are actually half-pig, half-sheep!” says Sean. Lisa and Alice are definitely all pig. There are three types of Mangalitza: the Red, the Blonde and the Swallow Bellied. Lisa and Alice are from the Red blood line. Sows can produce three litters in two years, but William will be taking things more slowly, and hopes that both Lisa and Alice will have three litters each over the next two and a half years.